It isn't the first time someone in Florida has been charged with wearing a mask in public, but it's "pretty uncommon," said a sheriff's department spokesperson. She was talking about the arrest of 19-year-old Matthew Lopez for the crime of "wearing a mask or hood on a public road." That law, passed in 1951, was intended to deal with the Ku Klux Klan, but in this case it was applied to a teenager wearing a clown mask with bright red-orange hair. A deputy spotted a clown and another man walking on said public road and, as anyone would do when confronted with someone wearing a clown mask, called for backup. When the deputy tried to speak with the pair, they ran, but were arrested a few blocks away. According to the report, in 2008 Tampa police arrested a man wearing a Batman mask in Ybor City, and charged him with violating the same law. But a judge dismissed the charges and ordered police to return the mask, which it turned out had been custom-made. 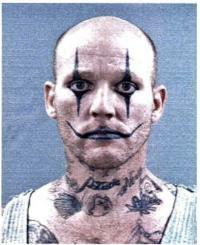 In other clown-related news, police in Ogden, Utah, said they were seeking Happy the Clown on suspicion of burglary and theft. Happy, also known as Tony Alexander Pete, is not actually a clown but has the street name of "Happy" because of his permanently tattooed "clown eyes" and happy "clown mouth." The Salt Lake Tribune stated that this made him look like a "rather scary harlequin," which sounds like something the Salt Lake Tribune would say. The permanent markings have the benefit of rendering Happy completely inconspicuous.